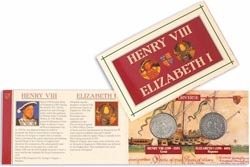 This pack contains a reproduction Henry VIII Groat with bust of Henry on one side and the royal arms on the other and a reproduction Elizabeth I Groat with bust of Elizabeth on one side and royal arms on the other. The pack is full colour with portraits of Henry VIII and Elizabeth I with the royal arms on the front. Historical information is presented on the inside front cover and the coins, that are held in clear blisters, are on the back cover.